Problem 1: How do you get the attention of your highest potential buyers? Answer: Use a concise headline in the most easily seen part of the exhibit - put it up high, make it big, light it up. Repeat the headline elsewhere in the exhibit. Use the company name nearby. Focus the headline on a specific product, or service and make a strong benefit promise. For example, Uni-tek's headline is "Broken Taps Removed Fast" in large, flood-lit lettering. Sharp focus like this attracts people who want what you have to offer. You have five seconds to attract the attention of potential buyers and less than five minutes to develop interest. Problem 2: How do you develop detailed product interest? 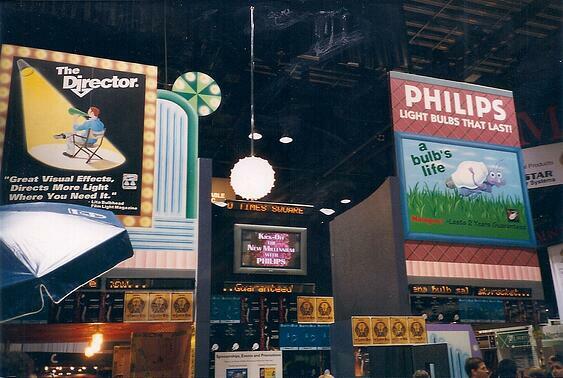 Photo: A 30" diameter model of the Millennium ball drops slowly a few times a day in synch with a video countdown at this 50' trade show booth for Philips light bulbs, drawing attention to the key product benefits on the billboards. Answer: Highlight the product. Use a sales message with the most important features and benefits. Show your product or service in action. Invite the potential client to participate in a product demonstration. Remember the product is the star. Consider a cutaway of your product to highlight how it works. Make a small product larger with a realistic larger-scale model as the center of attention in the booth, like the 5' high spark plug Bosch used. 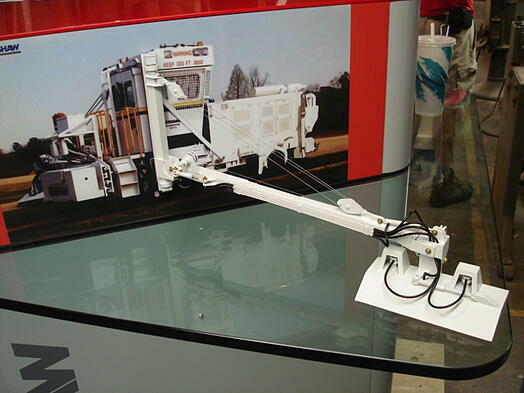 For a large product like a locomotive, aircraft, or mining truck, feature a smaller-scale model that fits in the trade show booth. Consider adding mechanical movement or chase lights to show the sequence of how the product works. The sales message should be simple and dramatic. A video or exhibit backwall with a few pictures and copy can tell your story quickly and effectively. Help the booth staff tell the product story with a few key visual aids that highlight the product's most important features and benefits. Problem 3: How do you follow up with the potential buyer? 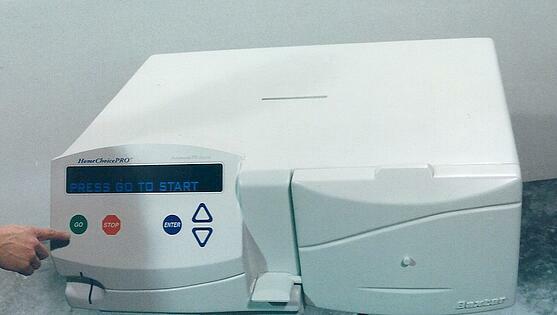 Photo: Business card drop box (slot) in a 2X scale prop model of a new medical device. Answer: Often several potential buyers show up at a trade show exhibit at the same time. A business card drop box offers a quick way to get a potential buyer's business card even when exhibit staff is busy with someone else. Provide blank name/address cards, too, and pens to make it easy to fill them out. Consider adding a question or two on the blank card to help qualify the prospect as a potential buyer. If the objective is to make an appointment with the potential buyer for a followup call, include a graphic that invites the visitor to sign up for a product demonstration. Include a large appointment book to make it easy. Another option is to integrate a private area or separate office into the exhibit area as a place to close a sale, show more detailed product options, etc. One technique to close sales is use of show specials: offer a lower price for orders at the show only, making the invitation highly visible. Did we pinpoint the product and sales message in the headline? Did we dramatize the product for immediate impact? Is the exhibit uncluttered and geared to a single objective? If yes, then you are on your way to having an effective exhibit. If you have any questions or would like to discuss exhibit design, a cutaway of your product, a product model, or a larger or smaller than life model contact us at Model Builders, Inc. 773-586-6500 or info@modelbuilders.net . Product models are an investment that often pays off big by increasing product sales. Here are five ways that product models boost results. 1) Product models attract attention to sales presentations by communicating in three dimensions. Models tell a story your client can see immediately, even without words. The visual story combined with your comments have a powerful, long-lasting impact. Perhaps my father, William H. Chaffee, a model maker for most of the 20th century, said it best: "Models enable you to visualize an idea or product in a scale you can relate to." 2) Product models are used to draw people into a trade show booth and start the sales conversation. They are an attention-getting focal point in the sales process. Just changing the scale of a product can command attention. 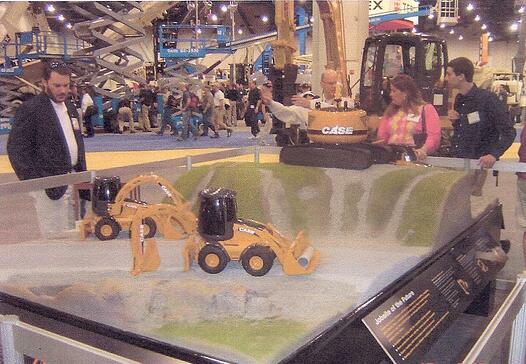 Small objects become gigantic and large objects can become small enough to fit in a 10' wide trade show booth. 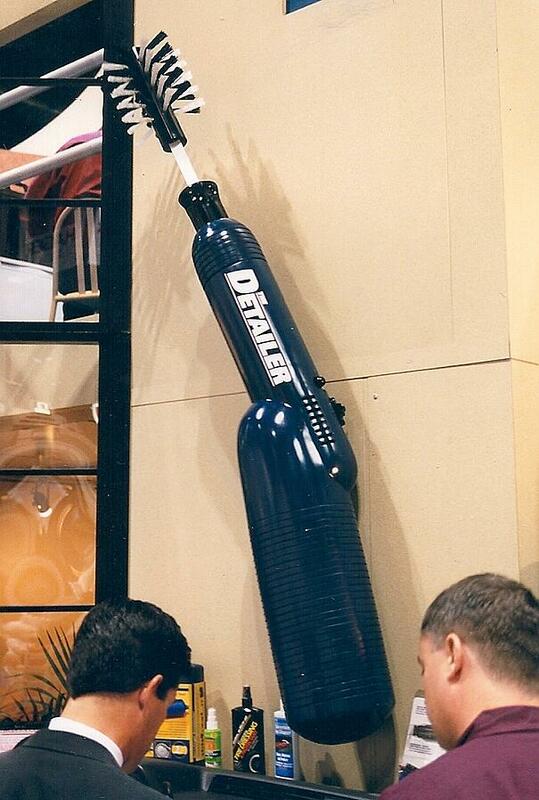 A 7' high detailer motorized brush as shown in the above picture, 8' tall drill bit, a 9' long windshield wiper blade with some new features, and a 6' tall toothbrush with lighted fiber optic bristles drew heavy traffic into their exhibit booths. Ordinary products command attention when produced in an unexpected scale and their unique benefits are immediately obvious. 3) "New" is one of the most response-generating words in advertising. Models can get new products in front of customers immediately through quick fabrication for presentations at a sales meeting, trade show, or photography for public relations releases. Prior to the first production run of a new industrial pool pump, a full scale exterior model was built for a trade show to introduce the product. The model was detailed down to the surface which had a casting texture painted on it. When the original product engineers first saw the model, some of them thought the model had come straight from the production line. Without the product model the company could only have shown two dimensional photographs or drawings with less impact. 4) Models can highlight product advantages by showing how the product works or revealing certain features. A cutaway model of a real product can show any unique feature and the quality of the materials used inside. 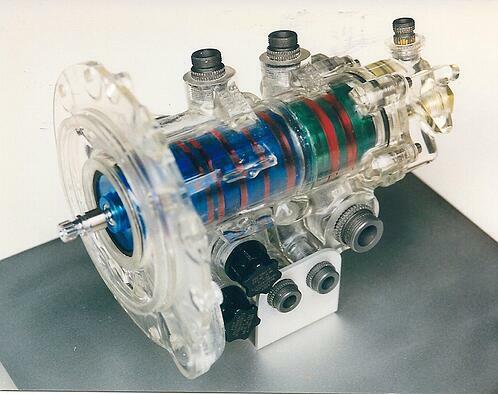 For example, one product model used a clear plastic housing and some internal translucent parts combined with some real parts to create a jet engine oil pump that revealed where the oil flowed and the unique parts that made it work. For another client, a 2X scale oven with 2" wide red/orange fluorescent plastic "heat arrows" inside showed the even flow of heat. 5) Closing a sale is often quicker when you use a model. For exmple a scale model of a trade show exhibit booth can sell the client on the booth design. Clients often cannot visualize a 3-D booth design as well as the designer. A model facilitates communication and clarifies any changes to the trade show booth design in order to gain a commitment to go ahead with construction of the booth. A model quickly and clearly shows the interior design, space planning, sight lines, traffic patterns, engineering, materials, colors, signage, and the interrelationships between various elements. The model helps to answer questions and solve potential problems. It is a fast way to understand a complex project and hence shorten the sales cycle. Done artfully and with skill, product models like those described above help increase sales. Take the next step by contacting us at Model Builders, Inc., 773.586.6500 or info@modelbuilders.net . Competition for attention is very stiff at a trade show. Companies that get noticed often have product models that grab attention and draw the passer-by into the trade show booth for more information. Here are five types of unique and enticing product models. A working model is a very effective way to attract traffic at trade shows. Demonstrating how the actual product works not only creates a vivid image in the potential customer’s mind but the action itself also draws the eye and stops traffic. 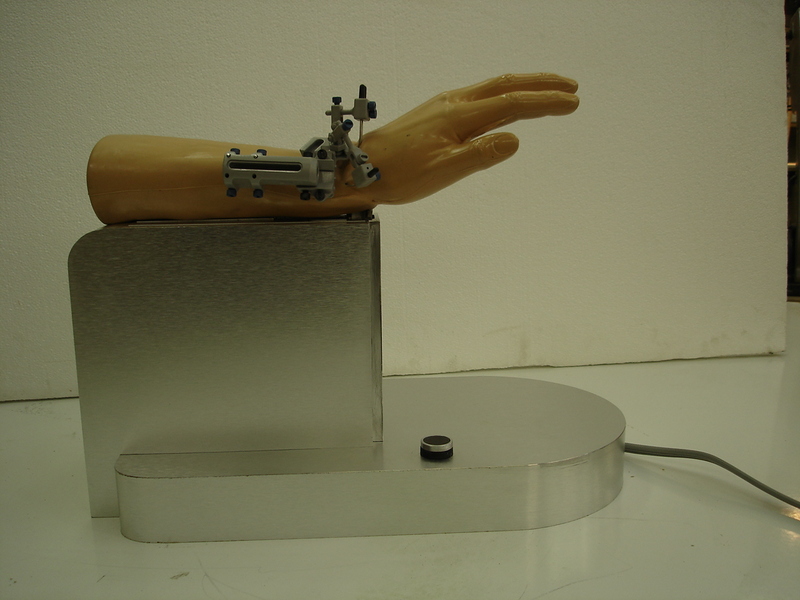 The medical device in these two pictures permits the hand to move while the wrist is recovering from a break instead of being fixed in one position in a cast. 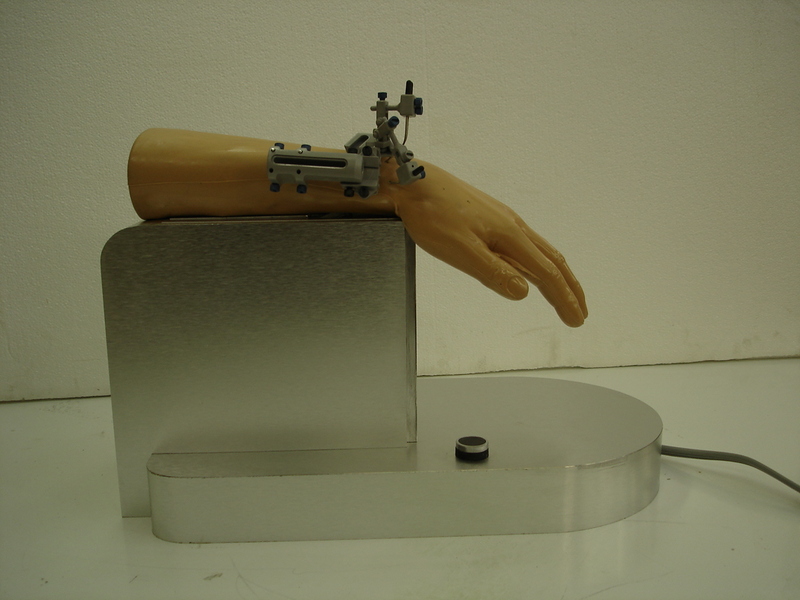 The hand is motorized to move slowly up and down to demonstrate the range of movement. Even with a static model you can create action to help draw traffic to your booth. Your product model might pop up out of a related setting such as a topographic or plant layout model. 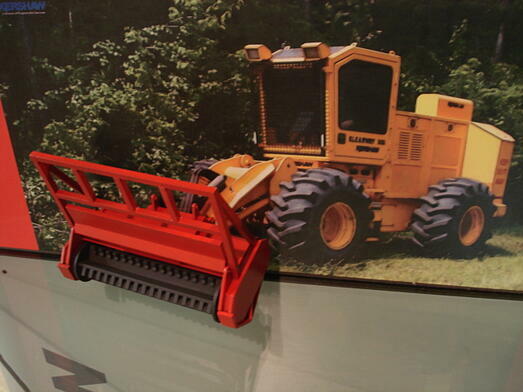 This techique is an attention grabber and at the same time cuts the cost to far below what it would be if you made a model of both the vehicle and the brush cutter in front. It also puts the focus on the brush cutter. The focus on the railroad right of way maintenance car is on the double bladed rotary cutter on the right. Product models are three dimensional, which is always more engaging than a flat display. But you can take this advantage one step further as well. You can place your model in a realistic setting that draws the potential client to the display. Another method is use your product model in conjunction with others (your product or not) to simulate the larger story of your product’s unique benefits. An interactive product model allows a person to learn about the product by starting, moving, pausing or stopping the operation. A user-controlled video alongside the product model could be added to help better understand your competitive advantages. Seeing someone who is engaged with your product makes others more likely to stop to see what it’s all about. Use product models like those described above to help the product sell itself and grab the attention of potential customers at a trade show. Give yourself a competitive edge with a product model that tells your product’s story with impact and often without the use of words. Take the next step by contacting us at Model Builders, Inc., 773.586.6500 or info@modelbuilders.net .